Beading tiny creatures is one of those activities that you cant get enough of once you start. The techniques may be simple, but the process -- choosing beads, stringing them, and watching animals take shape -- is mesmerizing. To make the colorful companions shown here, just follow our instructions on the next page for the back-and-forth beading method. Sit in a nice bright spot, near a window or a lamp. Cover a tray or table with felt or fabric to stop beads from rolling, and keep beads separated by color in shallow dishes or jar lids. Beads can be hard to pick up with fingers. Before you know it, they're bouncing all over the floor. To avoid this, lift beads by poking the end of your wire or tip of your needle into the hole, then use your fingers to slide the bead up the wire. The most common beads are round seed beads and long bugle beads. These are available in different sizes at crafts stores and bead shops, online, and from mail-order catalogs. We like coated wire, which comes in many colors. It's strong and flexible, so you can string beads along it without a needle. Keep your bead size in mind when choosing a stringing material -- whatever you choose must be able to pass through the bead's hole twice. To make a hanging charm, start with a jump ring. 1. Bend your wire in half. Place the wire's loop behind the ring. 2. Pass the loose ends of the wire first through ring, then through loop. 3. Pull ends down in front of ring to tighten. If first row has one bead, follow template. If it has more, thread them on alternating sides of the ring; proceed using the template, threading second row to the right of ring. To add a ring on the side, pass wire through before starting a row. All of our animals were made with the back-and-forth beading method. 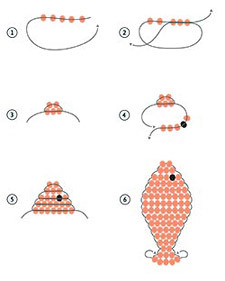 Follow these steps to learn the method and make a fish. Templates for other animals, and instructions for adding wings, legs, feet, and claws, are on the next page. 1. String five beads for the first and second rows (we used sizes from 2.5 to 3 mm) onto a 2-foot length of wire (we used 28-gauge coated wire). With beads at the center of the wire, pass left end of wire under row of beads and up. 2. Pass wire right to left through only the first three beads, for the second row. 3. Pull wire until the beads are tight. 4. Slip the five beads for the third row (including a darker bead for the eye) onto right end of wire. Pass left end of wire through all five beads. Pull wire until beads are tight. 5. Repeat step 4 with six same-color beads, then do a row of seven. Continue, following the drawing above, which shows how many beads to use in each row. 6. After you have done the last row, slip the extra lengths of wire back through the previous row of beads; pull tight, then snip off extra wire close to the beads. 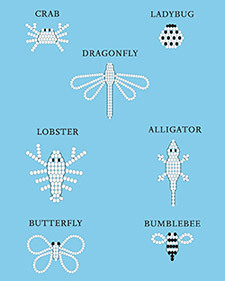 Make more beaded animals using the templates above with 2.5- to 3-mm seed beads and 28-gauge coated wire cut to the following lengths: bumblebee and ladybug, 20 inches; alligator and crab, 24 inches; butterfly, dragonfly, and lobster, 26 inches. 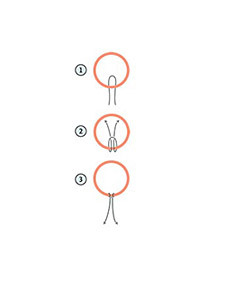 Use the back-and-forth beading method described on the previous page. Begin beading the body using the back-and-forth method. Once you've finished beading the body row where the wings should be attached, slip the wing beads onto one end of the wire (each template shows the number of beads you'll need for the wings). Loop the wire, then pass the end back through the first wing bead. Tug on the wire until the beads are snug. Make another wing on the opposite side with the other end of the wire. Then continue to bead the rest of the body. Begin beading the body using the back-and-forth method. Once you've beaded the body row where the legs should be attached, add leg and foot beads to one end of wire. To make each of the alligator's legs and feet, for example, you'll need five beads -- two for the leg; three for the foot. Loop the wire back toward the body, and push it back through the first two leg beads. Tug on the wire until the beads are snug. Repeat on the opposite side with the other end of the wire, then continue to bead the rest of the body. To make the lobster and crab legs, which are straight, add leg beads, then loop the wire back toward the body, and, skipping only the last bead added, push the wire back through all remaining leg beads. To form a lobster claw, slip on six beads; then, skipping the last bead added, pass the wire back through the previous two. Add four more beads; skipping the final bead, pass the wire back through the previous three and back through the beads to the body. Repeat on opposite side.